Happy New Year! Being snowed in for the third day in a row is a great reason to play some catch up, so here's what's been happening. 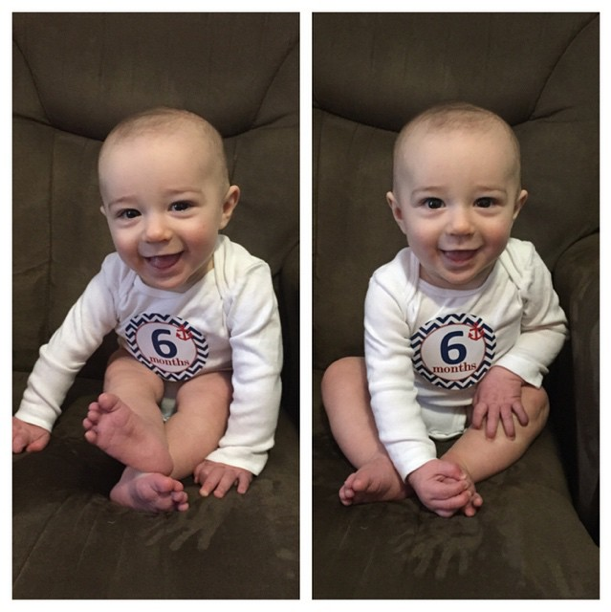 K3 is 6 months today (or 0.5 according to JD and O)! He is very much enjoying playing with toys, rolling around, and trying his first foods. He is just starting to sit up on his own and is thisclose to crawling. The teachers at daycare can't get enough of his big, flirty smile, and his transition to "school" has been as close to perfect as could be. One thing he has developed a strong dislike for is wiping his nose- which became a problem during his first cold, but thankfully we are past that! Hooray for NoseFrida and Boogie Wipes! The wedding is getting closer. 135 days away to be exact. We finally found someone awesome to officiate the ceremony, so since that is actually the most important part, everything else should be falling into place over the next few months. I am beyond excited, and the thought of wearing my dress, eating the food, looking at all the beautiful decorations and flowers, dancing to the band, partying with all our friends & family, seeing the boys all dressed up, and getting married ALL ON THE SAME DAY is blowing my mind. We got the biggest Christmas tree ever and celebrated for weeks. After getting it in, we were a little nervous to cut the strings. It was such a perfect tree, and I think I talked about how happy I was to look at it at least three times a day. Also- gigantic trees make your presents look small. Next time we get a big tree, we'll have to put the gifts in extra large gift boxes. Our boys are very lucky to have so many loved ones to spoil them, but the amount of gifts was overwhelming. We spread the opening out over a few weeks, and I think that helped them actually remember and appreciate the special things they were receiving. We hosted Christmas Eve dinner here for my family, and since I had to work right up until Christmas Eve, I ordered all the sides from our favorite local gourmet market and only had to cook the ham. Easy peasy! We rang in 2015 at Sesame Place with friends. We first went after Thanksgiving and enjoyed a rainy day in an empty park. NYE was a bit more crowded, but the parade and fireworks show were awesome. This season was my first time playing in the new Cookie's Monster Land, and although I miss our old favorites like the bed bounce and the giant nets, they did a really nice job of adding more rides and experiences to that area of the park. It's blurry, but I don't care. Keith and I have mastered getting the kids to bed early and easily in a hotel, so we were able to enjoy the day as a family and have a peaceful evening once the kids were asleep. We had to call in the fire department. In her old age, our dog, Macy, doesn't care much for our rules. While we were out, she dragged a bag of potatoes off the stove, and in doing that, turned on the burner (even with those child-proof things on the knobs). It didn't ignite, but the house filled with gas. Keith got home first and was so smart not go in, leave the lights off, get the dogs out, and call the local fire department. Pulling up to my house and seeing lights flashing and firemen in gas masks definitely was something I don't ever want to experience again! We hope you're enjoying the winter as much as me and my boys are! Added bonus: I can now see the floor of my laundry room. Only took three days!